I'm a white dude who grew up in Long Beach CA in the late 90's/early 2000's. I came up on rap music and have always been immersed in 'hood culture'. My friends, my interests, my personality, it all was influenced by that environment. Kendrick Lamar, only 2 years younger than me, growing up in neighboring city Compton, speaks a lot about what I saw growing up . Black Hippy is the rap group I chose to base my poster on. 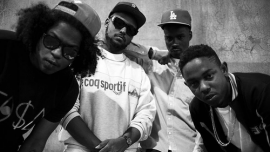 This group is composed of West Coast rappers Ab-Soul, Jay Rock, Kendrick Lamar, and Schoolboy Q. All of these artists are up and coming and represent a fresh step forward in hip hop music. The concept is to illustrate a neighborhood scene in Compton where the kids are idle and loitering. In the scene we find a lemonade stand but the word lemondae is crossed out and instead reads 'dope'. There is familiar iconography of the hood - pit bulls, cigarette butts, barred windows and gates, liquor and chrome rims. The neighborhood is run down but it's a sunny Southern California day and the overall mood is business as usual. just playing around with an idea. not ocmmitted.